©Gloria Stoll Karn. All rights reserved. Stockbridge, MA, April 11, 2018—In connection with its current exhibition Gloria Stoll Karn: Pulp Romance, Norman Rockwell Museum will hold an evening lecture on Gloria Stoll Karn and other female pulp fiction artists from the 1940s on Saturday, June 2, starting at 5 p.m. The talk will be presented by author and illustration historian David Saunders, the son of pulp fiction artist Norman Saunders. “There was no ‘glass-ceiling’ for women artists, authors, or editors in the pulp magazine industry,” notes Saunders, who will explore the challenges and opportunities that those working in the male-dominated field faced, in order to convey stereotypical notions of gender and sexuality. Saunders runs the website pulpartists.com, and is the author of books exploring the work of H.J. Ward and Norman Saunders, as well as It’s a Man’s World: Men’s Adventure Magazines, The Postwar Pulps. The talk is free for Museum members, or included with regular Museum admission. Artist Gloria Stoll Karn is recognized for her contributions to the pulp fiction industry during the 1940s, one of very few female illustrators working in the field to create illustrations and covers for popular romance and dime store magazines. This exhibition explores the artist’s short but prolific career, and her unexpected journey in a world previously assigned to male artists. 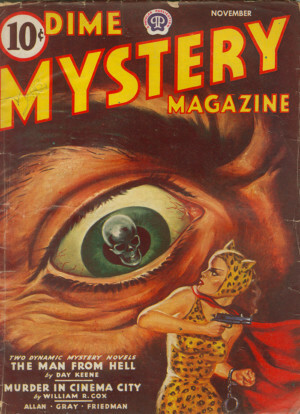 From 1941 to 1949, Stoll Karn’s art appeared on the covers and pages of many Popular Publication magazines, including Black Mask, Dime Mystery, Detective Tales, New Detective, All-Story Love, New Love, Love Book, Love Short Stories, Love Novels, Romance, and Thrilling Love, as well as Argosy. The artist, now in her nineties, continues to create art for her own enjoyment, exploring a range of themes and styles.